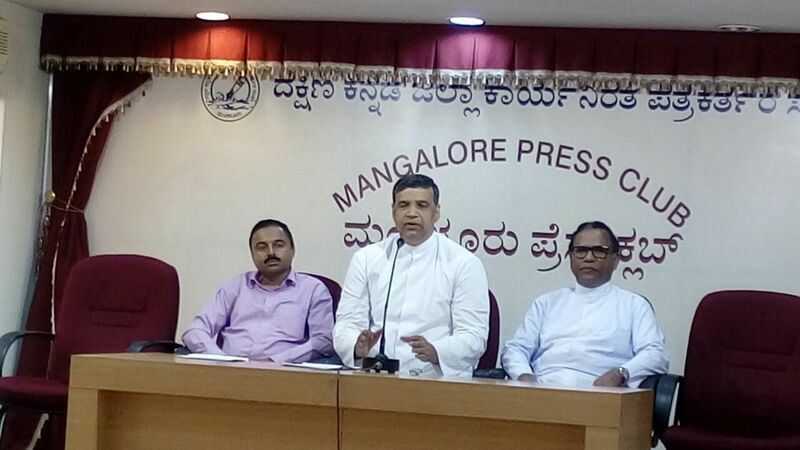 Mangaluru: The feast in honour of Relic of Saint Anthony will be celebrated on 15th of February. In preparation for the feast the nine days Novena begins on 6th of February. The inauguration will be done by hoisting Saint Anthony’s Shrine flag at Our Lady of Miracles Church Milagres. Rev Fr Franklin D’Souza, the director of Family Counselling Centre Shimoga will hoist the flag and celebrate the inaugural Mass at Milagres Church. Before hoisting the flag a vehicle rally will be held at 4 pm, wherein decorated Saint Anthony’s Statue will be taken in procession from Saint Ashram Jeppu to Milagres Church via Kankanady circle, Falnir road. The main festive Holy Mass will be celebrated by Most Rev Dr Aloysius Paul D’Souza on 15th February at 6 pm at Milagres Church ground. A Holy Mass in Malayalam will be celebrated by Most Rev Dr Varghese Chakkalakal bishop of Calicut at 4.30 pm at Milagres Church. For the sake of sick and elderly a Holy Mass will be offered by Very Rev. Dr. Pius D’Souza, Episcopal Vicar for Religious at 8.15 am at Milagres Church. Rt Rev. Msgr Denis Moras Prabhu the Vicar General of the diocese will offer Holy Mass at 11 am at St Anthony’s Ashram Jeppu for the invitees and special invitees. Fr Onil D’Souza the director of the Institutes, Fr Francis D’Souza the administrator, Mr Vincent Mascarenhas the Diocesan Media Secretary were present on the occasion. The feast in honour of Relic of Saint Anthony will be celebrated on 15th of February. In preparation for the feast the nine days Novena begins on 6th of February. The inauguration will be done by hoisting Saint Anthony’s Shrine flag at Our Lady of Miracles Church Milagres. Rev Fr Paul Melwyn D’Souza, the Superior of St Anne Friary Bejai will hoist the flag and celebrate the inaugural Mass at Milagres Church. Before hoisting the flag a vehicle rally will be held wherein decorated Saint Anthony’s Statue will be taken in procession from Saint Ashram Jeppu to Milagres Church via Kankanady circle, Falnir road. Rev. Fr Anish P.V. Parish Priest of St Antony’s Jacobite Syrian Cathedral Jeppu will flag off the really and with a prayer and short message. The main festive Holy Mass will be celebrated by Most Rev Dr Aloysius Paul D’Souza the Bishop Emeritus of Mangalore Diocese on 15th February at 6 pm at Milagres Church ground. A Holy Mass in Malayalam will be celebrated by Rev Dr Joy Putheveettil from Allepy Diocese at 4.30 pm at Milagres Church. For the sake of sick and elderly a Holy Mass will be offered by Rev Fr Maxim D’Souza, Professor St Joseph Seminary Jeppu at 8.15 am at Milagres Church. Rt Rev. Msgr Maxim Noronha the Vicar General of the Diocese will offer Holy Mass at 11 am at St Anthony’s Ashram Jeppu for special invitees. On the eve of feast i.e. on 14th after the Holy Mass one hour 2D drama Santh Anthoni, Potr Potik Pavoi (Saint Anthony, kindly reach my letter to my husband) will be staged in the open ground. It is a drama based on the miracle that happened in the 17th century. After this miracle took place people started writing S.A.G. (Saint Anthony Guide) on the letter asking Saint Anthony to reach the letter safely to the person addressed. The Drama is written by Mr Clarence Pinto Padil and directed by Mr Vincent Fernandes of ‘Mogachi Lahra’ fame. Fr Onil D’Souza the director of the Institutes, Fr Thrishan D’Souza the Asst director, Mr Vincent Mascarenhas media co-ordinator were present on the occasion.